I’ve been thinking about this as we’re in the process of updating (and upgrading) our go-to-market plan at Imagine. As we’re developing our plan, it’s become clear to me that there are three distinct types of B2B prospecting, each of which needs its own customized strategy to be successful. To build a predictable growth model in the B2B sales world, you must choose which approach(es) you’re going to implement and dedicate the necessary resources to be successful. The worst thing you can do is try a one-size-fits-all prospecting approach. What It Is: A new category (which isn’t really new at all) of marketing called Account Based Marketing is increasing in popularity. It is essentially what I’ve always called “pursuit lists.” Instead of waiting for people to find you, or working off big lists, strategic prospecting requires that you identify a select number of specific targets that you will pursue. The number varies by industry, complexity of sale and average value but should rarely be more than 50 per salesperson (and often should be closer to 20). Who should be involved: Strategic prospecting is an “all hands on deck” effort. Your new sales team as well as your lead generation and marketing teams all work in an aligned fashion to develop the prospect into a customer. The keys to success: Strategic, or account based, prospecting flips the traditional marketing process on its head. Rather than broadcasting to a wide audience and filtering leads as they come in, you do significant filtering in advance to proceed with a highly orchestrated, multi-channel, multi-tactical effort to initiate conversation and advance the opportunity. You’ll want to coordinate phone calls with emails and even customize and personalize their web experience when they visit your site. Account based prospecting requires a very high level of personalization. When selecting accounts for this effort, you should choose ones that clearly fit your headpin (ideal) customer profile and represent larger than average opportunities. You’re going to want to do some research in advance of the effort on each of the companies that you will be targeting, so that you can customize your challenge message to them. Your effort and outreach to them cannot feel cold, and you must be willing to commit resources to the effort. Account based marketing represents a significant commitment and often a significant investment. They also represent the biggest opportunity and, managed appropriately, the biggest payoff. 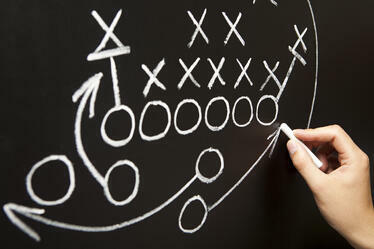 What It Is: Tactical prospecting is probably the oldest and most popular form of prospecting. It involves developing a targeted list of companies and individuals. From there, you implement a series of campaigns and other outbound efforts to initiate conversations, fully qualify the opportunity and position for your new sales team. Who should be involved: Tactical prospecting is built for a sales development team. This is the prospecting that new sales people often do, and shouldn’t. Your marketing and lead generation team should also be involved in supporting this effort. The keys to success: Tactical prospecting requires that you commit the hours consistently to work your lists. Research continues to show that it’s taking more time and effort to connect with qualified prospects. If you don’t dedicate consistent effort to reach out, you’ll only gain a small fraction of the benefit of your efforts. Think about it, if it takes six attempts to reach someone over the course of a month, and you only make four, you’ll put forth 2/3rds of the effort for zero gain. Additionally, the skillset and approach needed to be successful with this type of prospecting is quite different than that needed to be successful once an opportunity had been defined. At any given time, only about 2 – 7% of a given market is actively considering taking action. There’s no lasting effect from this effort. It works as long as you’re working it. If you take a little time off from focusing on it, the benefits of the effort disappear. Without an effective content marketing effort, timing and luck have as much to do with success as strategy and skills. If you move beyond content marketing to inbound marketing, you gain an additional benefit of leveraging your prospecting time with the leads developed through inbound. What It Is: The zero moment of truth (ZMOT) has revolutionized the buyer-seller dynamic. An effective inbound marketing effort is required to win the ZMOT. Who should be involved: Your full lead generation team (including any sales development team) should be charged with implementing and managing this prospecting effort. The keys to success: An effective inbound marketing effort requires the combination of good strategy and excellent process. A clear focus of who your ideal customer is, and who they aren’t, is required to avoid wasting resources and gaining traction. You must also have a solid lead triage process in place to ensure that you allocate your resources effectively to turn qualified leads into sales opportunities. It is also important that your marketing, lead generation and sales teams all be in alignment, working together to make inbound a profitable tactic. Ideally, your company should be implementing all three prospecting strategies for success. Far too often I see companies attempt all three haphazardly. If you are not able to fully support all three, focus on the one that you can fully support. Focusing on one will bring you closer to achieving predictable, sustainable and scalable sales growth than attempting all three without a complete effort.